A new Elon University Poll finds that a large majority of educators in the state say arming teachers with guns is a bad idea and would increase gun-related deaths in schools. 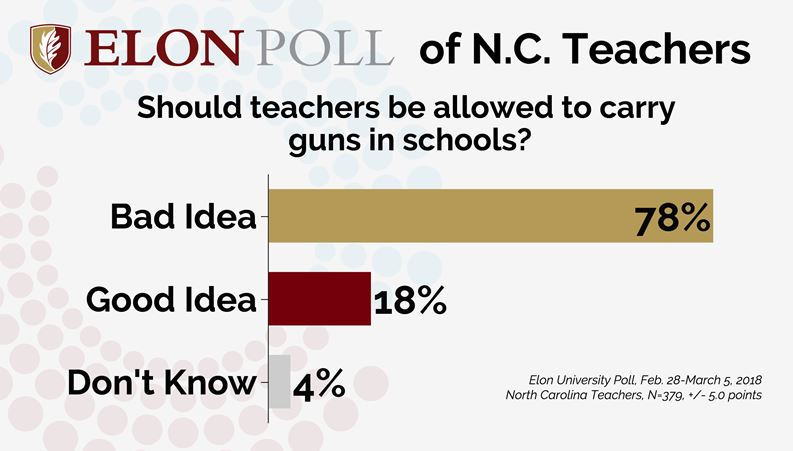 More than three-quarters of North Carolina public school teachers believe that allowing teachers to carry guns in school is a bad idea, according to a new Elon University Poll conducted in partnership with the Raleigh News & Observer and the Charlotte Observer. The poll found that only a quarter of teachers would consider carrying a gun in school if allowed to do so. The survey of North Carolina teachers in a range of public schools across the state comes during an ongoing national conversation about the best ways to deter shootings on school campuses. President Donald Trump has advocated for arming teachers who have received special training, a proposal that has been implemented in a few school districts around the country and is now being more widely considered by local, state and federal officials. The Elon Poll found that a majority of N.C. public school teachers said allowing teachers to carry guns on campus and in the classroom would be harmful to the learning environment, would make them feel less safe, and would ultimately lead to an increase in gun-related deaths in American public schools. Most expressed concern that a gun carried by a teacher would fall into the wrong hands. The poll gathered opinions about a range of school security measures being considered and whether armed teachers could reliably stop a school shooting. The poll also assessed the familiarity of N.C. teachers with using firearms. Additionally, the Elon Poll report includes open-ended comments from teachers about the survey that provide further insights into their thoughts on the issues, correlated with how they responded to the questions and their demographic information. These comments are available in the complete poll report, available online here. The survey of 379 N.C. public school teachers was conducted Feb. 28 through March 5, with respondents contacted by email as well as using live-caller, dual-frame (landline and cell phone) survey techniques. Survey results in this news release have a margin of error of +/- 5.03 percent (questions asked of all 379 email and telephone respondents) and +/- 6.6 percent (questions asked only to the 227 email respondents). The full poll report indicates which questions were asked of all respondents and which were asked only to those contacted by email. 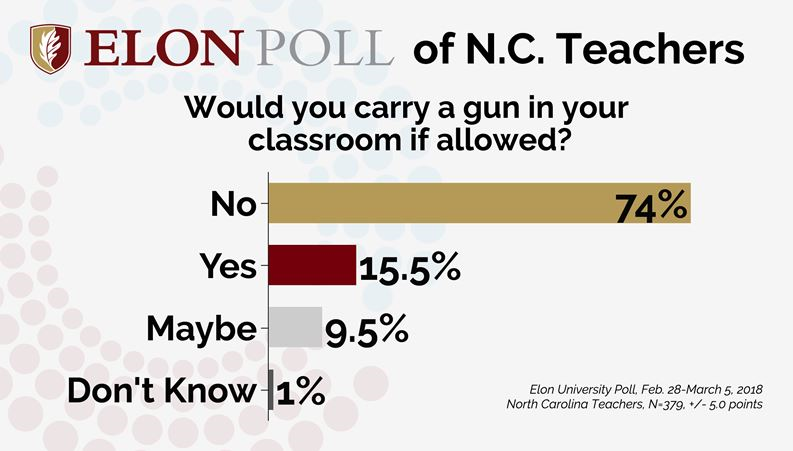 The Elon Poll found that nearly eight out of 10 N.C. public school teachers (78 percent) said allowing teachers to carry guns to school is mostly a bad idea. Just 18 percent viewed it as a good idea, with 4 percent saying they didn’t know. When considering the teachers in their own schools, only about 12 percent had confidence that those armed teachers would be able to reliably stop a school shooting. Forty-six percent thought a few of their fellow teachers could use a gun to stop a shooter and 42 percent said none of their colleagues would be able to do so. Responses varied based on a number of factors, such as race and political party affiliation. Non-white teachers were more likely than white teachers to think that arming teachers is a bad idea. Among non-white teachers, 91 percent were against arming teachers compared to 75 percent of white teachers. Republicans were more likely to believe arming teachers is a good idea and were more willing to carry a gun themselves than independents or Democrats. Sixty-eight percent of those surveyed said it is likely guns carried by teachers would accidentally fall into the wrong hands and slightly more than half (51 percent) said a policy of arming teachers would increase the number of gun-related deaths in schools. That compared to the 22 percent who said arming teachers would decrease the number of gun-related deaths and 19 percent who said it would make no difference. Another 8 percent said they don’t know what the impact would be. Sixty-one percent of N.C. teachers said they would feel less safe in school if teachers are allowed to carry guns, compared to 23 percent who said they would feel safer and 14 percent who said it would make no difference in how safe they feel in school. The remainder of respondents didn’t know. Looking further at Elon’s results, the poll found that younger teachers (those under the age of 50) were more likely to say they would carry a gun at school, while teachers in Eastern North Carolina were the most likely to be in favor of carrying a gun themselves. White teachers and male teachers were more likely than non-white teachers and female teachers to carry a gun in school if allowed, the poll found. Teachers in suburban schools were slightly more likely to arm themselves if allowed, and those teaching in elementary and middle schools were slightly more likely to carry a gun, if allowed to, than those teaching in high schools. The Elon Poll also found differences along racial, geographic and party lines when it comes to the broader impact on learning if teachers carry guns. Asked about how arming teachers will impact the ability of students to learn, 65 percent of teachers said it would “mostly harm” the learning environment while 10 percent said “mostly help” and 22 percent said it would have no effect. The remainder said they didn’t know. Opinions on the matter shift somewhat depending upon where the teachers are in the state. Western N.C. teachers were more likely to say it would harm the learning environment than their counterparts in the Piedmont or Eastern North Carolina. Those teachers in Eastern North Carolina were the most likely to say that arming teachers would have no effect on the learning environment. The Piedmont was in the middle on both counts (and geographically). Democrats were much more likely to say armed teachers would harm the learning environment than Republicans, by a margin of more than two to one. Eight-eight percent of Democrats said it would be harmful compared to 59 percent of independents and 40 percent of Republicans. Thirty-nine percent of Republicans said arming teachers would have no effect on the learning environment compared to just 7 percent of Democrats. A strong split was also found along racial lines, with 80 percent of non-white teachers saying such a policy would be harmful to the learning environment compared to 60 percent of white teachers. Twenty-five percent of white teachers said it would have no effect on the learning environment compared to 9 percent of non-white teachers. Those respondents who were contacted by the Elon Poll by email received a longer battery of questions that provide some insights into support for measures beyond equipping teachers with guns. The results from these questions answered by the 227 email respondents have a margin of error of +/- 6.6 percent due to the smaller sample size. 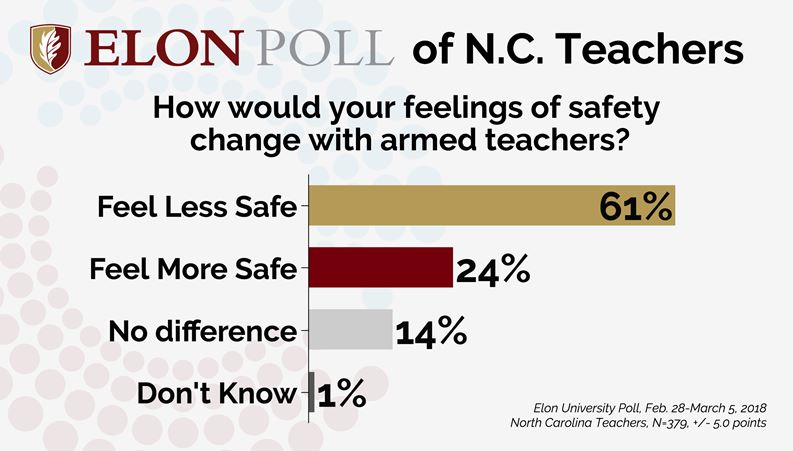 The Elon Poll also sought to gauge the familiarity N.C. teachers have with firearms by asking about their experience and skill level. More than a third — 36 percent — said they were somewhat or highly skilled with handguns. A fourth said they were not very or not at all skilled with handguns while 39 percent said they had never fired any type of gun.